The advantages of therapeutic massage therapy are obvious and immediately felt: reduced muscle tension, heightened relaxation, broken up lactic deposits, and released endorphins, to name a few. Those benefits can be maximized when a massage is paired with a complementing therapy, such as an infrared sauna. Both therapies work to alleviate issues throughout your entire body, and back-to-back appointments can both extend the period of time devoted to healing and the lasting after effect of the treatments. Experience this advanced healing for yourself by making an appointment for a massage and sauna experience at Heavenly Hands of Maricopa today. 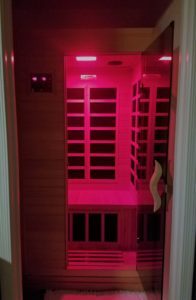 A FAR Infrared Sauna is a sauna that employs FAR infrared light to heat you up, instead of using convection (heated air or steam) or conduction (through heated wood). Infrared light is part of the sun's invisible spectrum. Our visible spectrum goes from red up through violet, the colors of the rainbow: red, orange, yellow, green, blue, indigo, violet. Infrared means "below-red" just like ultraviolet (UV) means "above-violet." A FAR Infrared Sauna uses the far part of the infrared spectrum. These two parts of the spectrum are both invisible, yet they still have very different effects on the body. UV light has been associated with many health risks, whether it is from spending too much time out in the sun or from going to tanning salons. Infrared light is the exact opposite end of the light spectrum and is associated with many positive and healthful effects. Infrared is that deep inner warmth you feel when standing in the sun. We live in a world filled with fat soluble toxins such as gasoline, solvents, pesticides, plasticizers, and chemical dioxins, and it is vital that we try to rid our bodies of these toxins because they are a source of disease. 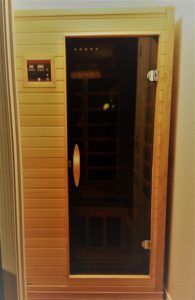 Sauna Therapy is an established treatment for chemical poisoning and helps detox your system, which is one reason I have recently added a dry infrared sauna to my practice. A sauna session helps to warm, soften and loosen muscles prior to receiving a massage. 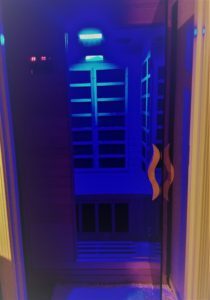 Utilizing the Infrared Sauna before your massage will maximize the effects of your session and you will notice the amazing benefits you receive from your massage will last much longer.